As a teen I wrote a letter to my hero Nelson Mandela, outlining my respect for his courage and the anguish young Australians felt over the apartheid regime. I never really expected him to read it. In 1990, my family was given the rare chance to attend a Parliament House lunch in Canberra as part of Mandela’s first Australian tour since he walked free from jail. During that lunch my younger sister got up close to Mandela and took the chance to pass him my note. This book is now a family treasure. 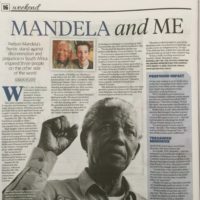 I shared story with journalist Simon Plant via today’s Herald Sun as Melbourne Museum is hosting Mandela My Life: The Official Exhibition. It’s a once in a lifetime chance for Australians to view memorabilia from Mandela’s extraordinary life, including a set of boxing gloves signed by Muhammad Ali. 1990 does seem a lifetime ago, yet there’s no doubt the freedom fighter has had a long standing impact on many Australians. Mandela fought to advance female equality. In 1996, he signed the final draft of South Africa’s constitution granting comprehensive women’s rights. We need to continue to share the story of Mandela and the many women freedom fighters. Tickets to the exhibition can be found here. Tagged in Mandela my life official exhibition, Nelson Mandela, Nelson Mandela feminist.